This is a “mock” cheese blitz recipe, originally submitted by Judy Hensley, a Scott County Schools Culinary Arts Teacher from Gate City, Virginia. The mock term is used because blintzes are usually made of crepes or a crepe like pancake. These are made with sliced white bread. Who knew plain old white bread could be dressed up so nicely? I think you will have fun with these. Cut the trim off the bread with a bread knife. Roll each slice out with rolling pin until it is really flat. Mix the cheese, sugar, and egg yolk well. Spread on each piece of bread and roll each one up. Don't roll it really tight. Lay aside. You have enough filling to do all the bread. In bowl 1 melt 2 sticks of margarine. In bowl 2 mix together 2 cups white sugar and 3 tablespoons of cinnamon well. Dip each one in butter and then roll in cinnamon sugar. Have someone to help you, one do the butter and one do the sugar. If you go from butter to sugar you have a mess. If there no one to help me I dip them all in the butter and lay on foil then dip them in the sugar. Bake on foil lined pan or parchment paper at 350ºF for 8 minutes. Remove as soon as they come from the oven. Makes as many blintzes as there are slices of bread, about 16. Serve 2 per person. 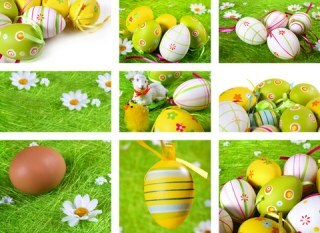 Add some color to the blintzes by adding raisins or chopped dried cranberries or apricots to the cream cheese mixture. It would be pretty and taste great. Plus it ups the nutritional value of this easy recipe. This would be a great recipe for kids to help with. They’ll love them when they are ready to eat too. 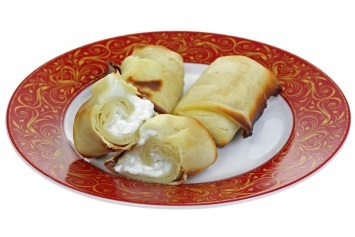 If you like this cheese blintz recipe as an easy dessert, have a look at our other suggestions.